Season five of the world’s longest running Sci-Fi television show introduced us to the Eleventh Doctor (Matt Smith). Like all the previous Doctors had to spend some time figuring out just who he was and what kind of Doctor he was going to be. With his bowtie and Fez hat, Season Five lead us to believe that the Eleventh Doctor was a fun-loving cosmic tourist, out to see the Universe with his companion the Amazing Amy Pond and her beloved Rory. But it turns out that isn’t who the Eleventh Doctor is at all. The Eleventh Doctor is Batman. In Doctor Who – The Complete Sixth Series, the character and the storyline take a distinct and drastic tone-shift to Gotham City. Like the 1950s’ Batman to the 1980s’ Batman, The Doctor went from fun-loving (but dangerous) good times to actual death and cruelty. In an interview, series writer Stephen Moffat has said that this direction-shift was purposeful, and in Season Six he tried to “Batmanize” the Doctor Who series. By Batmanize, he meant not only the darker tone of the series, but the idea that Batman creates his own enemies. If there was no Batman, there would be no Joker, no Two-Face, no people who define themselves as being in conflict with the Batman. Moffat felt that with The Doctor’s legend as a powerful and mighty warrior, he would give rise to people whose sole mission in life is to fight The Doctor, by any means necessary. 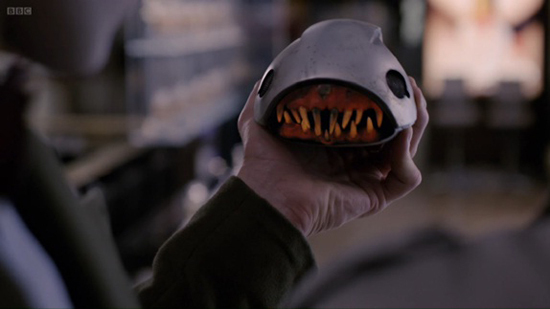 He also wanted a villain on the level of the Weeping Angels, something terrifying enough that they would enter the Doctor Who mythos along with the Cybermen and the Daleks. To fill that role he gave us The Silence. It took me awhile to warm up to Moffat’s vision. Even though I was totally against Matt Smith when he took over as The Doctor—after deciding that the Tenth Doctor was the greatest of all-time—I was instantly won over by the light-hearted and fun nature of the interpretation. I loved the idea of a magical childhood figure come to life, and was put off by the first episode of Season Six—”The Impossible Astronaut“—which serves up death as an opener and only got darker from there. Sure, there were some lighthearted blasts of entertainment in there, but things were pretty grim. But by the time of the seventh episode, “A Good Man Goes to War,” the quality storytelling had won me over and I was totally hooked into Moffat’s vision. I saw how terrifying it is when the light-hearted man turns deadly serious. And Season Six is serious. Without giving away any spoilers, Season Six deals with some big questions for The Doctor. The main one—Who is River Song? –turns out to be an amazing twist that took me by surprise. Even deeper than that, The Doctor must come to grips with why he has Companions when so many of them die, and what is his role in the Universe on the whole? It is some bleak stuff, and the answers aren’t really fun. The episode “The Girl Who Waited“ was particularly heart-wrenching. My only disappointment with Series Six was the lack of continuity of emotion. 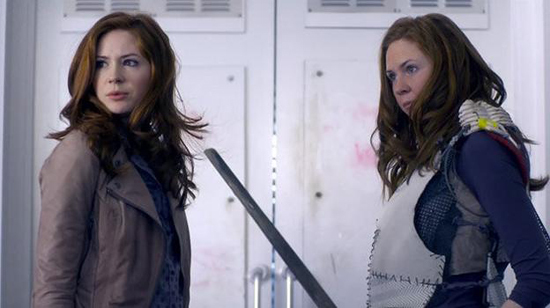 Some of the episodes, like “The Girl Who Waited,” were completely devastating to those involved, but with the next episode they were right as rain and back to cracking wise and the best of friends. If you are like me and only watch Doctor Who on DVDs—one right after the other—then it can be disconcerting to see a character developed and then white-washed over the space of two sequential episodes. The DVD box set itself is adequately excellent. I am glad I waited for the complete sixth season rather than getting the separate Part One and Part Two boxsets. This set includes not only all the episodes, but also the Christmas special, the two Comic Relief sketches, the prequels, and some cool extras like “Monster Files” andDoctor Who Confidential. I know they are planning to come out with a limited-edition set featuring four lenticular prints with various characters. If you are a collector you might want to wait for that. Personally, I care more about what is on the DVDs than what they box is made of, so this set was perfect.